Kafa Theme The Kafa restaurant website theme will help you build a strong brand on the internet. Take advantage of the integration with an online food ordering system and make your restaurant website profitable. 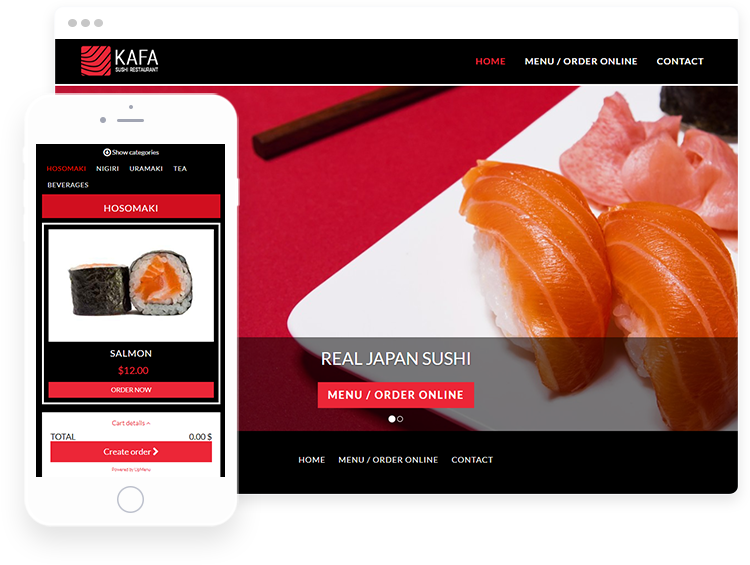 The Simple CMS that supports your activities The Kafa restaurant website theme will help you build a great restaurant website, thanks to a simple CMS. In this way, you will be able to showcase your restaurant to your clients online without the help of IT specialists. Building a website using the Kafa restaurant website theme is very simple. Within a few moments you can easily adapt the template to the brand image of your restaurant. The strength of minimalism A simple restaurant website template will highlight what's best in your restaurant - delicious food. Show great pictures of your dishes and increase conversion, thanks to the transparent restaurant website design. UpMenu restaurant website templates are built so that your customers are immediately directed to the online food ordering system menu. Show the climate of your restaurant The Kafa restaurant website theme will allow you to show the amazing atmosphere of your restaurant. Use colours to let your customers feel the mystery and unique aromas as if they were there. Design a restaurant website theme that will help you show what's best in your restaurant. Use photos and adjust the template to your brand. Enjoy greater profits Thanks to the integration of the Kafa restaurant website theme with an online food ordering system you will be able to gain completely new customers. 85% of potential customers are looking for a restaurant on the internet. Let them find you. Intuitive navigation will help these customers place online orders, and you will realise more food deliveries and takeouts. Your Restaurant website will no longer generate costs and you will start earning a living.